There is no end to cuteness. Sure, it may be near the end of 2012, the year I turned four on Dec. 20, but it’s really just the beginning. In my 2012 paw blog, I proved that I am the CEO of Cuteness, the cutest dachshund worldwide and the cutest, prettiest, darling-est dog ever. I also made sure that dog owners realized the importance of loving their pets, paying attention to them (like all of the time) and giving them lots of treats. In other words (or barks), I explained the elements of responsible pet ownership, while giving a glimpse into the life of a talented dog that can blog. Though I have successfully completed my first year (plus another 1 ½ years about other topics) of blogging, I have run into a conundrum. I don’t know what to blog about in 2013. Yes, I probably will wax prosaic about my cuteness factor, but like a scientist who proves a theory, I think I’ve proved mine. Though, one photo would be enough to demonstrate my 10+ rating of being cute. 52 Ways to Love Your Pet (I have more to talk about in this area). 52 Dog Tricks (I can sit, lie down, roll over, type, blog and catch balls). A dog’s life in 52 segments (kind of like how Charles Dickens serialized some of his books in magazines). 52 Poems and Stories, as written by Zoey the Dachshund. Do you have any ideas for a dog writer? What do you think of my ideas? And, though I know the answer already, don’t you just think I’m the cutest? When bonding with a puppy, as shown here when I was just six months old, it’s best to read books on how to train, love and bond with your new BFF. If you are thinking about becoming best friends with a dog or puppy, I recommend you read a few books to get to know us better. 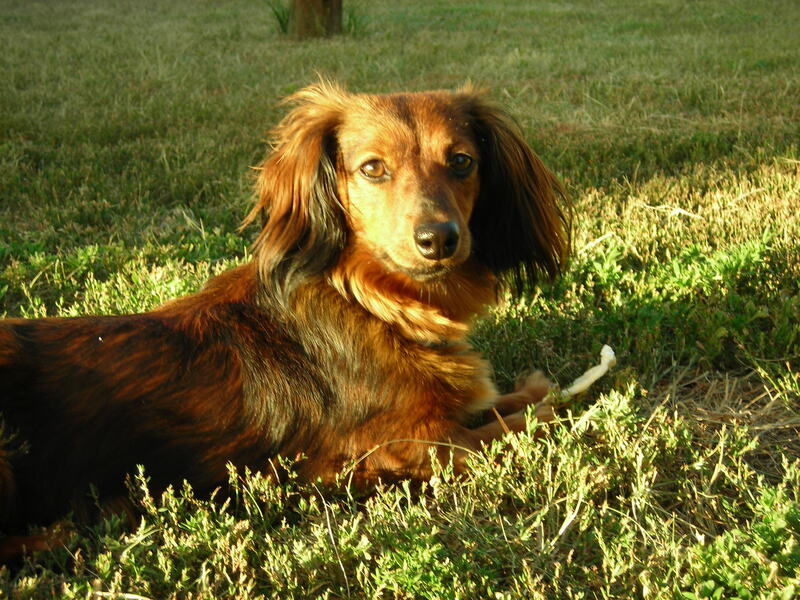 First, read some of the Dummies series, such as “Puppies for Dummies,” and “Dachshunds for Dummies” (if you own a breed like mine, which is the extraordinarily cute miniature long-haired dachshund). After that, try out books that explain why we act the way we do and how we see, smell and hear our worlds. Finally, give us lots of love, plus daily walks, playtime, attention and treats. How Dogs Think, What the World Looks Like to Them and Why They Act the Way They Do, Stanley Coren – A must-read for any pet owner to become better informed about dog behavior and how best to love us. I suggest treats and lots of playtime. Why Does My Dog Act That Way? A Complete Guide to Your Dog’s Personality, Stanley Coren – This guy’s really smart and you should read both of his books. As for my personality, I am playful, energetic and scared, but act brave, around big dogs. Inside of a Dog: What Dogs See, Smell and Know, Alexandra Horowitz – We’re smarter than you think, plus we have a keen sense of smell and see the world in different colors than humans. Zoey the Cute Dachshund blogs and reads books, too. As a dog blogger with a talent for reading, reading and digging, I have a few favorite books. The books I like feature dog characters. I prefer when dogs are the main character, but if the humans have to take center stage, minor dog characters will do. I even like a cat book or two. The Art of Racing in the Rain, Garth Stein – A book told from the vantage point of a lab-terrier mix named Enzo, how could you not love it? Dog on It, Spencer Quinn – Chet, the dog sleuth, is a main character who solves mysteries. City Dog, Alison Pace – There’s a dog, Carlie, as one of the main characters who gets her own television show. Dog Years, Mark Doty – I forget what this is about, but I read it. Corduroy Mansions, Alexander McCall Smith – One of the characters is a Pimlico terrier named Freddie de la Hay who is a vegetarian. Can you believe it that a dog doesn’t eat meat? I like chicken, in case you were wondering. Dewey: The Small-Town Library Cat who Touched the World, Vicki Myron – Though a cat is the main character, I still like this book. Who Moved My Cheese? Spencer Johnson – No, it’s Who Moved My Bone?Zoey Suzanne Widhalm. I have a character arc. I began as a cute dog. In the middle of my life, I will be a cute dog. And I will always be a cute dog. For one, miniature dachshunds as a general rule are cute. And two, I am the top-of-the-heap cute. Wouldn’t you agree? Check out these photos and see just how cute you think I am. I am the CEO of Cuteness after all. BTW, My birthday is in 18 days on Dec. 20. Have you put my birthday on your calendar? Thank you for doing that. P.S. BTW A Second Time, I like treats and toys and lots of attention! I am wearing my mechanics outfit. Don’t I look adorable? I also am adorable here, don’t you agree? I’m adorable even when I sleep. Here I am out in nature as Miss Organic Dog. I’m an organic dog who lives an organic life. Woops, that’s not the right “organic,” Shelley, my co-blogger and a human, is telling me. “I’m referring to writing,” she says as I’m pawing out my thoughts for this week’s blog. “Fine, fine, what is it you mean?” I bark my question at her. She tells me that she’s blogging about writers who outline and plan everything out, versus those who write organically, winging it as they go. “I give you treats,” Shelley says. “Can I have my favorite chicken-flavored milk bone, please?” I whimper, showing her my sad, I-feel-left-out and oh-so-lonely eyes. See, that’s planning in full force. I got to Point B. Wait, I’m back at Point A because I have eaten my treat and am in want of another. Shelley is ignoring me as she writes stuff about her novel. I hope I’m in there, I bark in my thoughts. “She gets her spark back?” I bark. I beam my doggie smile and get back to work, thinking about how to get another treat.